"Hello to life-forms throughout the universe! This is the race you've all been waiting for!" 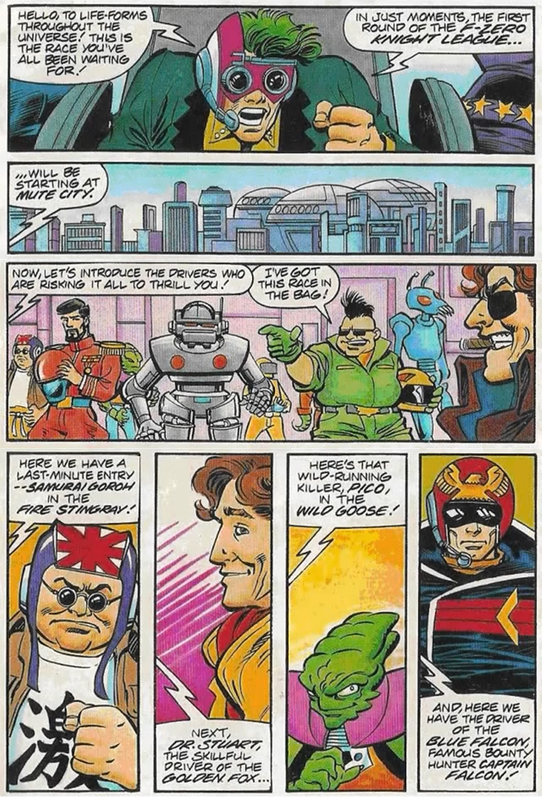 "In just moments, the first round of the F-Zero Knight League will be starting at Mute City." "Now, let's introduce the drivers who are risking it all to thrill you!" "I've got this race in the bag!" "Here we have a last-minute entry -- Samurai Goroh in the Fire Stingray!" "Next, Dr. Stuart, the skillful driver of the Golden Fox..."
"Here's that wild-running killer, Pico, in the Wild Goose!" "And, here we have the driver of the Blue Falcon, famous bounty hunter Captain Falcon!" * Note the comic has a different spelling in the name of Dr. Stewart.